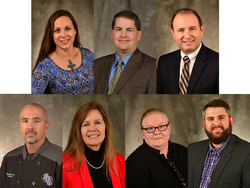 Stephen F. Austin State University will recognize seven faculty members during its Teaching Excellence Awards Convocation at 1:30 p.m. Tuesday, April 10, in the Baker Pattillo Student Center Regents' Suite A on the university campus. Top row: Sarah Canterberry, Scott Bailey and Steven Galatas. Second row: Todd Barrios, Gina Harden, Inga Meier and Jeremy Stovall. NACOGDOCHES, Texas - Stephen F. Austin State University will recognize seven faculty members during its Teaching Excellence Awards Convocation at 1:30 p.m. Tuesday, April 10, in the Baker Pattillo Student Center Regents' Suite A on the university campus. This event is free and open to the public. Dr. Gina Harden, assistant professor of management in the Rusche College of Business, joined the faculty in 2013 after completing her master's degree at the University of Texas at Tyler and her doctoral degree at the University of North Texas. Harden teaches management productivity systems and management information systems to both graduate and undergraduate students. She serves as the faculty advisor for the Society for Advancement of Management, a professional student organization. Her research interests include enterprise social software and knowledge management. She received the 2014 Outstanding Intellectual Contribution Award and the 2015 Outstanding Researcher Award for the College of Business. Dr. Scott Bailey, associate professor teaching graduate courses in educational leadership, is in his sixth year at SFA. Previously, he served as a campus principal, assistant principal, curriculum director and high school chemistry teacher in schools across East Texas. Bailey also works as a professional service provider and is sanctioned by the Texas Education Agency to assist struggling public school districts and campuses. Additionally, he serves as a trainer for the Texas Teacher Evaluation System where he has trained more than 1,000 teachers and principals about quality instruction and continuous improvement. As a researcher, Bailey focuses on instructional leadership and improving instruction, especially in the online environment, and effective principal preparation programs. Dr. Inga Meier, assistant professor in SFA's School of Theatre, joined the College of Fine Arts in 2015. She teaches courses in play analysis, theatre history, film history, dramaturgy and more. She received her Bachelor of Arts in English literature and theatre from Rutgers University, her Master of Fine Arts in dramaturgy with a graduate certificate in cultural studies from Stony Brook University, and her doctoral degree in theatre history and performance studies with a doctoral certificate in film studies from the University of Pittsburgh. Her research is focused on performances of terrorism, violence and trauma. Her writing has been published in Film and History, The Theatre Annual and in the anthology "Recovering 9/11 in New York." She currently serves as secretary and debut panel coordinator for the Theatre and Social Change Focus Group of the Association for Theatre in Higher Education. Dr. Jeremy Stovall, associate professor of silviculture, joined SFA's Arthur Temple College of Forestry and Agriculture in 2010. He received his Bachelor of Science from Clemson University, his Master of Science from the University of Vermont and his doctoral degree from Virginia Tech. Stovall teaches dendrology and silviculture, among a number of other graduate and undergraduate courses. Each summer he teaches a travel course on field ecology in the southern Appalachian Mountains. His research focuses on restoring severely disturbed ecosystems using various silvicultural tools, such as herbicides, mechanical site preparation and thinning. Stovall also serves as the faculty advisor to the Sylvans, SFA's timbersports team that has won four of the past five Southern Forestry Conclaves. Dr. Steven Galatas, associate professor of political science, joined the SFA faculty in fall 2005. Galatas received his bachelor's degree in political science from Ouachita Baptist University, his master's in political science from Vanderbilt University and his doctoral degree from the University of Missouri. He teaches basic courses in American and Texas government, as well as advanced courses in the politics of the Middle East, European countries and the European Union. He has led study-abroad programs to Germany, Belgium and Canada. His research examines links between party competition, partisanship and voter turnout in elections in Texas, Canada, Germany and the United Kingdom. Dr. Sarah Canterberry, associate professor in the Department of Biology, teaches courses for biology majors and non-majors and enjoys the diverse population of students. She is the faculty advisor for several clubs, including Tri-Beta Biological Honors Society, Women in STEM and Yoseikan Budo. A native of Nacogdoches County, Canterberry began her academic career at SFA, and returned as a faculty member in 2008. She earned a Bachelor of Science in animal science in 2001 and her doctoral degree in genetics in 2006, both from Texas A&M University. She spent two years as a postdoctoral research scientist in the College of Veterinary Medicine at Texas A&M University. Canterberry's research interests include surveys of pathogens carried by insects in East Texas and genes associated with normal muscle development. SFA also will recognize Todd Barrios, clinical instructor in SFA's School of Human Sciences' hospitality administration program, with the Faculty Senate Teaching Excellence Award, which honors non-tenure track faculty members. A certified executive chef through the American Culinary Federation, Barrios is ServSafe certified in food safety and sanitation and as an instructor. He is a registered ServSafe examination proctor through the National Restaurant Association. Additional focus areas are culinary arts and food service management. He earned a Bachelor of Science in home economics with a concentration in hospitality and institutional services and a Master of Arts in adult education from Northwestern State University in Natchitoches, Louisiana. Barrios is originally from New Orleans and has extensive restaurant management and culinary experience.